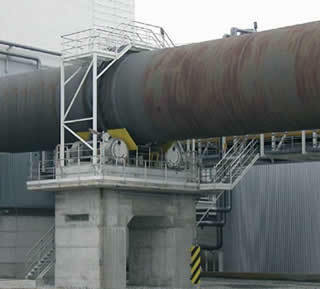 Lime Kiln Process presents one of the most challenging measurement and control solutions in the Pulp and Paper mills. The complex dynamics and multi-variable nature of the lime kiln process, with its non-linear reaction kinetics, long time delays and variable feed characteristics, make the process inherently difficult to operate efficiently. During its operation, many interconnected variables must be considered and control actions must be designed to meet multiple and sometimes conflicting objects. An additional difficulty is the reliability and/or accuracy of some of the measurements that are needed for even the basic controls. The operation may also be upset by severe disturbances and certain process variables must be maintained within predefined constraints in order to ensure safe operation of the process and to protect the environment. Control of the kiln process is thus, in many respects, a demanding task and therefore most of the kilns have been and are still operated without supervisory-level control system. Economical pulp mill operation dictates the recovery of the spent cooking chemicals and dissolved wood compounds that are removed from the digester. This chemical recovery is performed in the recovery boiler and causticizing processes. The causticizing process, in turn, requires reliable source of calcium oxide (CaO). In the causticizing reaction, calcium oxide (CaO) is converted to calcium carbonate (CaCO3). Calcium carbonate is the major constituent of lime mud. 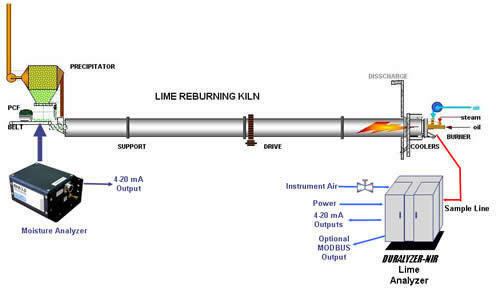 The Lime Recovery System is designed to take the calcium carbonate (CaCO3) and convert it back to calcium oxide (CaO). This lime is again used in the slaking and causticizing processes. The conversion reaction is known as calcining or lime burning. ​Lime produced in this fashion is known as reburned lime. This reburned lime must be of high quality as determined by its ability to slake. Calcium oxide (CaO) slakes with water and is converted to calcium hydroxide (Ca(OH)2). Reburned lime produced in the lime kiln is a solid, and is whitish/grayish green in color. It forms in small pebbles when correctly calcined. Impurities enter the mill with the wood, water and makeup chemicals. They tend to build up in the lime and lime mud. Typically, the reburned lime will be about 82 - 90% calcium oxide (CaO) with 10% - 18% impurities including 2-6% residual carbonate (CaCO3). Lime mud is separated from white liquor in the white liquor clarifier/filter and mud washer. It will enter the Lime Kiln System from the storage tanks at about 40% solids, will then be concentrated to about 74-79% solids content at Precoat Filter before entering the kiln and contains about 90% CaCO3 and 10% impurities. In the lime kiln, calcium carbonate (CaCO3) is converted to calcium oxide (CaO). This reaction, known as calcination, requires an exposure to temperatures in excess of 1500 F. Exposure to these temperatures results in the liberation of carbon dioxide gas (CO2). The calcination reaction is: CaCO3 (Solid) + Heat --- > CaO (Solid) + CO2 (Gas). Lime mud enters the lime kiln at 74-79 solids and 21-26% water. Lime mud is calcium carbonate plus impurities. The water is evaporated and the lime is heated to at least 1500 F for calcination to begin. The calcination reaction goes faster at temperatures in excess of 1500 F. Due to reaction time limitations, calcining temperatures of about 1800 F will be used. Gas or oil is burned in the kiln to supply the heat. At some times NCGs (Non-Condensable-Gases) are also contributed. The calcining temperature is a key variable in determining lime quality. The lime produced in the lime kiln is used in the causticizing process. The causticizing and lime recovery processes are extremely interdependent. Quality variations in the lime kiln create problems in the causticizing process. These causticizing problems then will in turn create problems with the lime kiln and digester operation. System upsets eventually smooth out, but it takes time. It is, therefore, important to carefully control the processes to minimize disturbances.